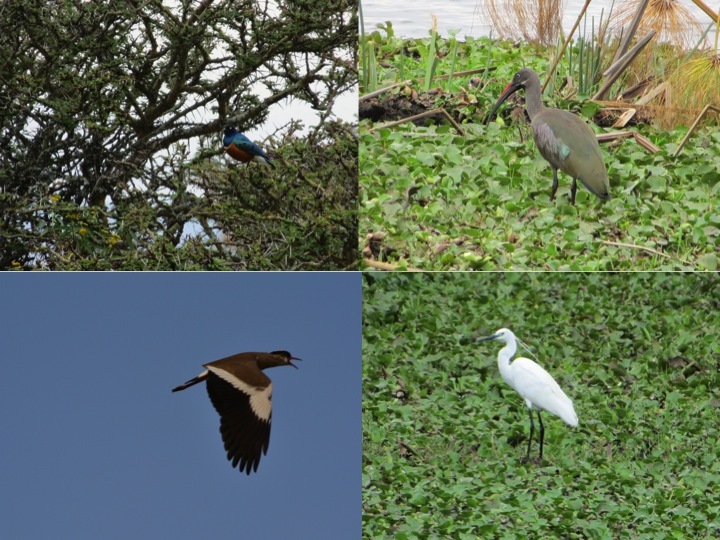 We went on a surprisingly awesome trip to Lake Naivasha, not this past weekend, but the weekend before. Sorry this post is a bit late! Our internet was out all weekend so were not able to get this post published sooner. 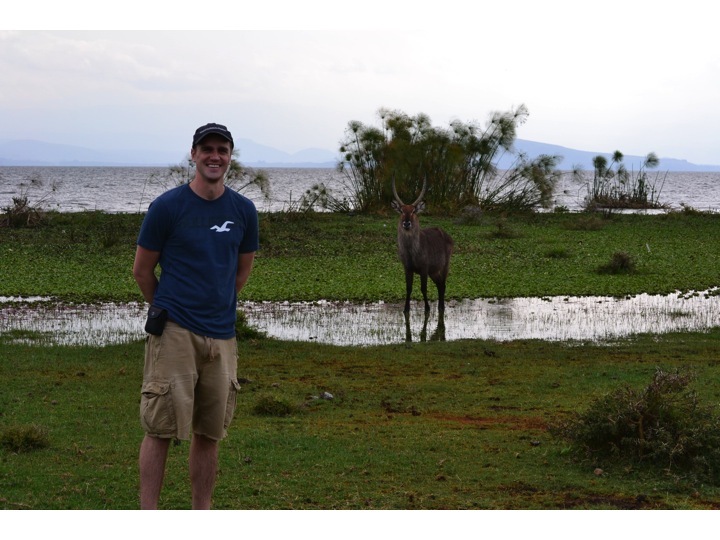 I say “surprisingly” awesome because Lake Naivasha is not necessarily a tourist hotspot like the Mara or Lake Nakuru, and people did not get excited when we told them we were going there. 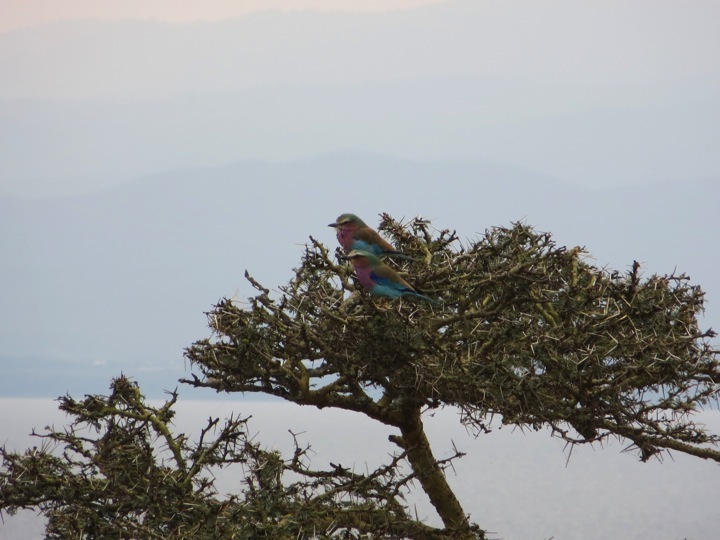 Additionally, our last-minute replacement driver was a stranger (sort of a friend of a friend), so we kept our expectations low–but it was great, jam-packed, adventuresome weekend and we again experienced the beauty of Kenya! On Friday afternoon, our driver, Antony, arrived early to pick us and our friend Steve (a fellow Duke resident) up and immediately we clicked with Antony and fast became friends. We exchanged stats about our lives and shocked each other with cultural facts from our respective countries and lives with a lot of joking in between. 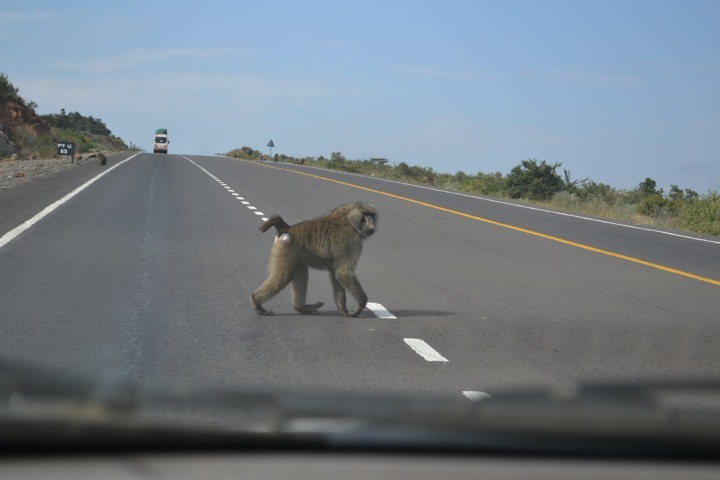 We hoped to see some animals over weekend, but again, kept our expectations low, so when a pack of baboons crossed the road on our way to Naivasha we were excited. It proved to be a great foreshadowing of what was to come! We heard that all of the flamingos had left Lake Nakuru (the place that we had initially planned going where literally millions of flamingoes flock) and some had headed to Lake Oloiden, which is a small lake next to Lake Naivasha so we headed there first before the sun could set on our first night there. 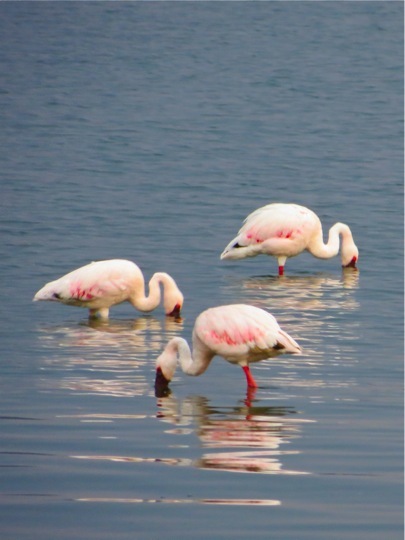 We were delighted to see the beautiful pink, tall birds before it got dark! After viewing the flamingos we drove to our lodging passing zebra, giraffe, and gazelle on the way, had dinner, and made our way to our lodging for the weekend. We stayed at Fisherman’s Camp in a “banda” that slept the four of us. On the top left you can clearly see that Scott is way too tall to fit on the bed, as the wall-to-wall distance for sleeping was only 5’9″, and he is 6’4″. In fact, only our driver, Antony, was short enough to sleep comfortably. The first night, it was so muggy in our banda with no air circulation, and Scott felt so trapped in his little bed that he had a minor panic attack (which he never has before) at about 1:00AM and suddenly made a big racket unbolting the door so he could sprint outside to be free and get some fresh air. On the right side you can see our lovely private bathroom consisting of a cement floor with a hole in the ground. On the bottom left is the outside view of our banda. 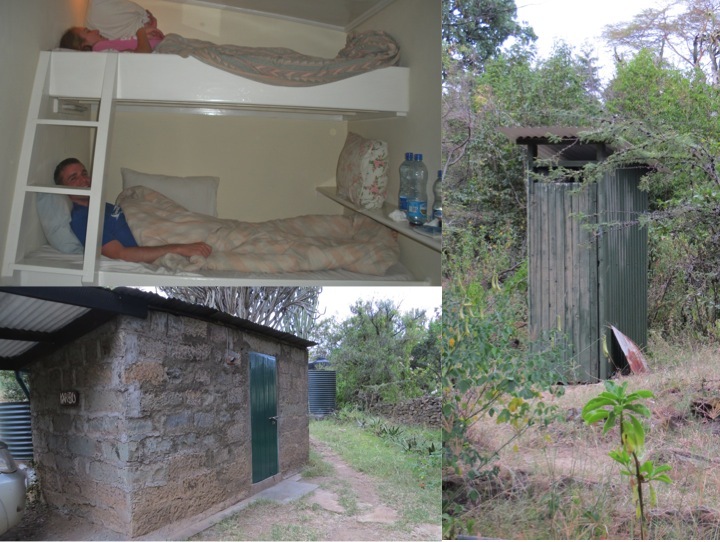 Needless to say, it’s no Ngerende, but the price was right at sh1000 (about $12) per person per night and surprisingly they did have hot showers! 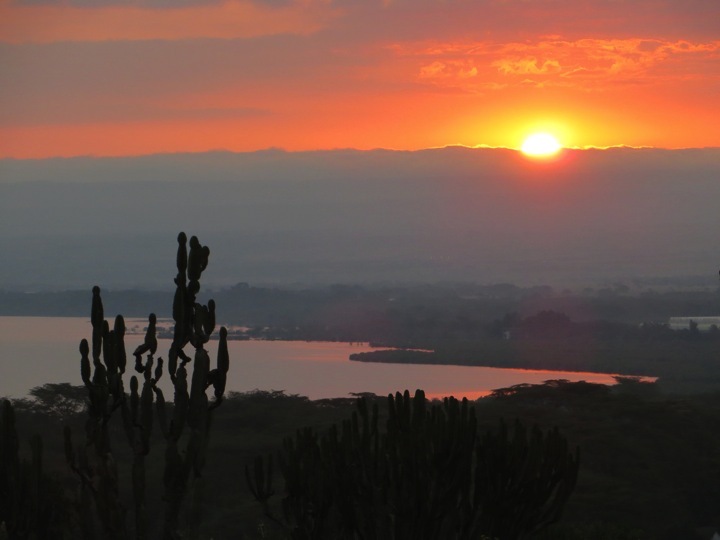 We woke up early the next morning and this sunrise over Lake Naivasha greeted us as we drove the short distance to Mt. Longonot. 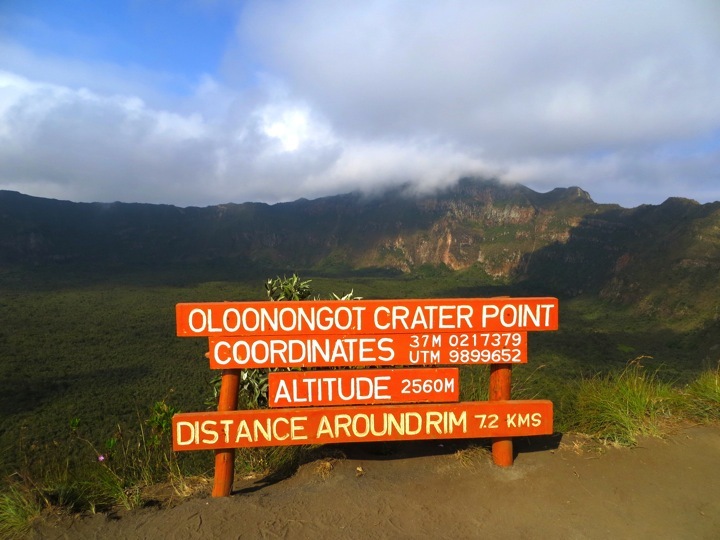 Mount Longonot is a dormant volcano that has a huge, deep crater on top of it with a smaller satellite crater one off the side. 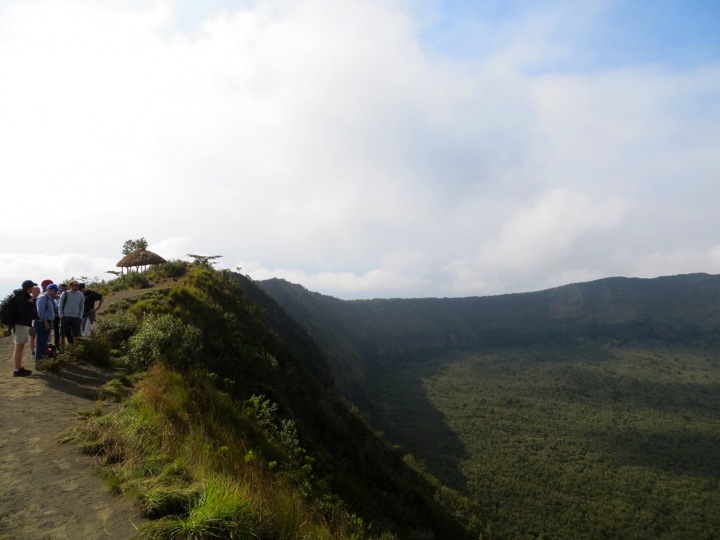 Both craters are remnants of the volcano’s eruption. 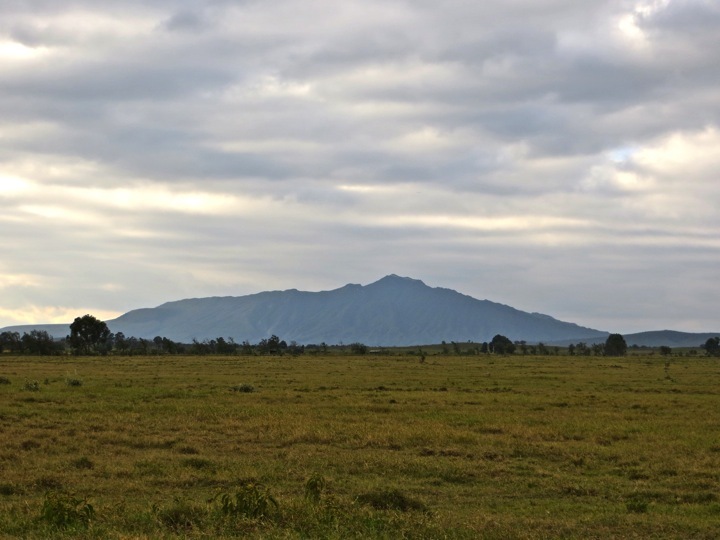 Mount Longonot as seen from Hell’s Gate. 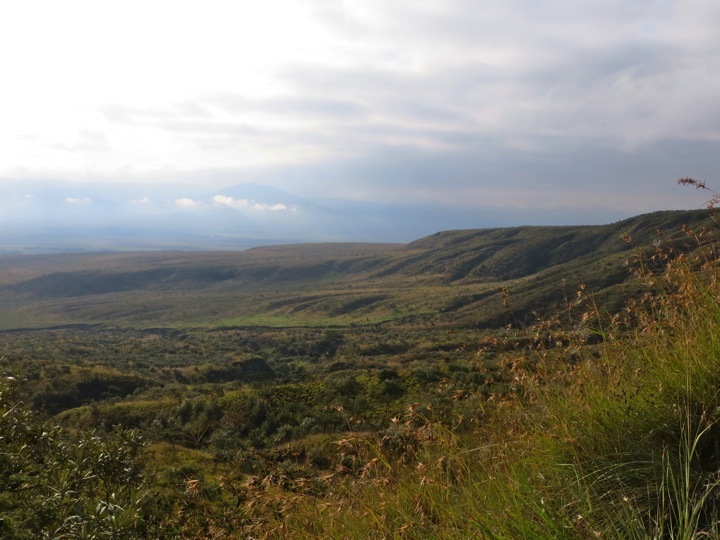 The more flat slope is on the left side is the rim of the crater. 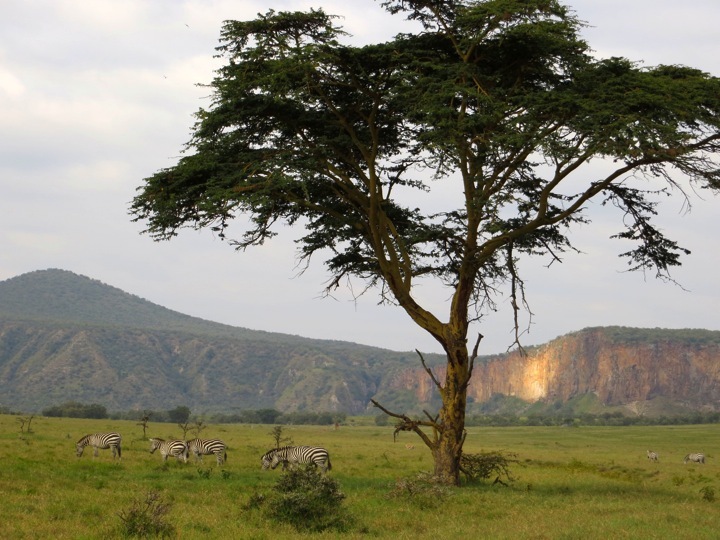 The peak on the right side of the mountain is the highest point on the crater’s rim and the summit of the mountain. 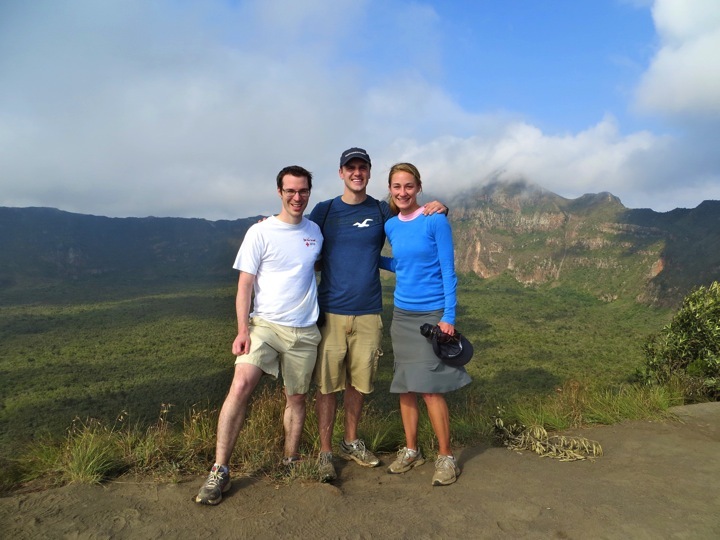 Even on our hike up, the mountain and surrounding landscape were already so beautiful! Crater stats. Love the cloud shadows in these pictures. The view to the left. The group of men there were from all over the world and were in Nairobi for a United Nations safety and threat course. One of the men is a Risk Analyst for the UN and his job is to analyze threats, decide whether or not certain countries are safe for foreigners to be. He also “eliminates threats” . . . I think you can read between the lines there, right? The funnest member of the group though was their leader (at least the leader of the hike), a hilarious, energetic, crazy Dutch man that had more Dutch pride than all of Pella, IA combined. (Maybe that’s an exaggeration?) It was a pleasure meeting all of these men, hearing their stories, and observing how they joked and bickered with one another about their respective countries’ past entanglements. Leaving the UN group behind we started on our 7.2Km trek around the crater. Left side: the path ahead. 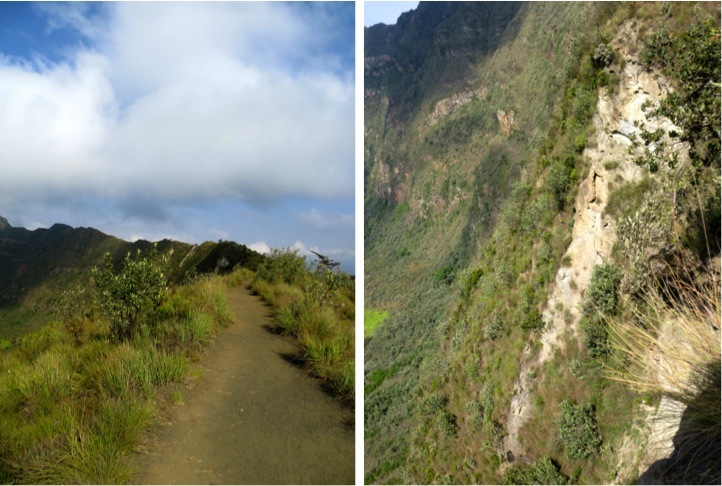 Right side: the steep crater wall–don’t want to fall off the path! Looks like we might be in the clouds when we reach the summit! We passed by the small satellite crater on our right. Getting higher and closer to the peak, but we still have a long ways to go! 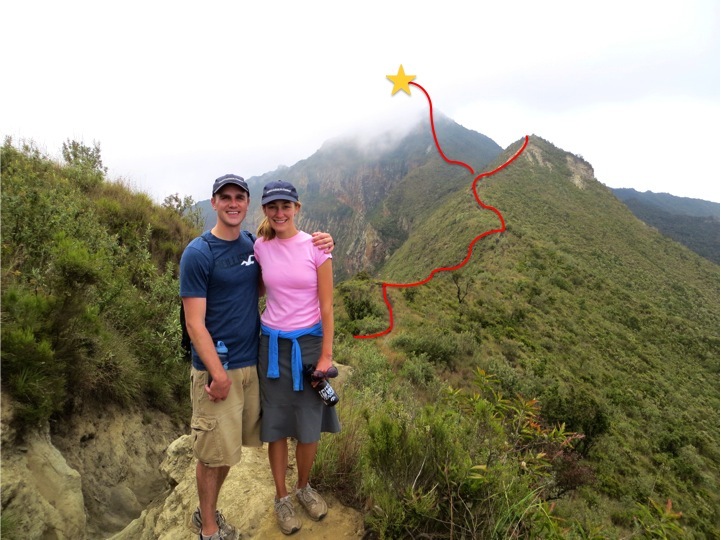 The red line shows the path to the peak. Left: Scott taking in the crater. Top right: A lava tube formed from the outside cooling faster than the lava flowing inside. 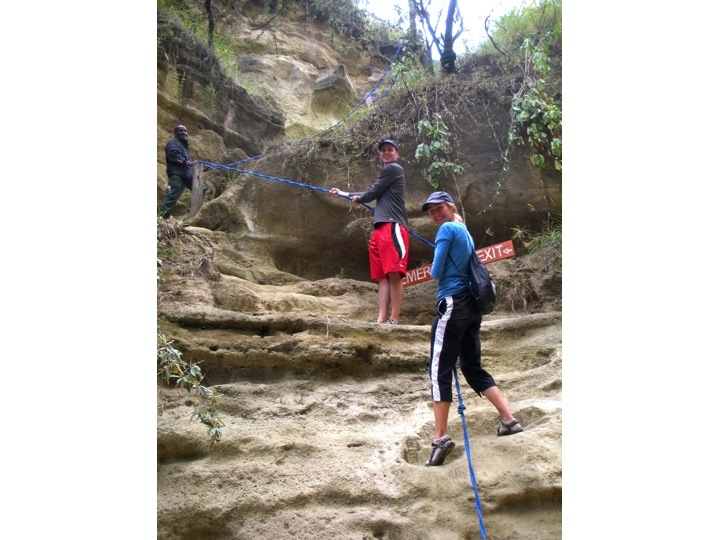 Bottom right: The narrow, and steep path up. One last look before we’re in the clouds! 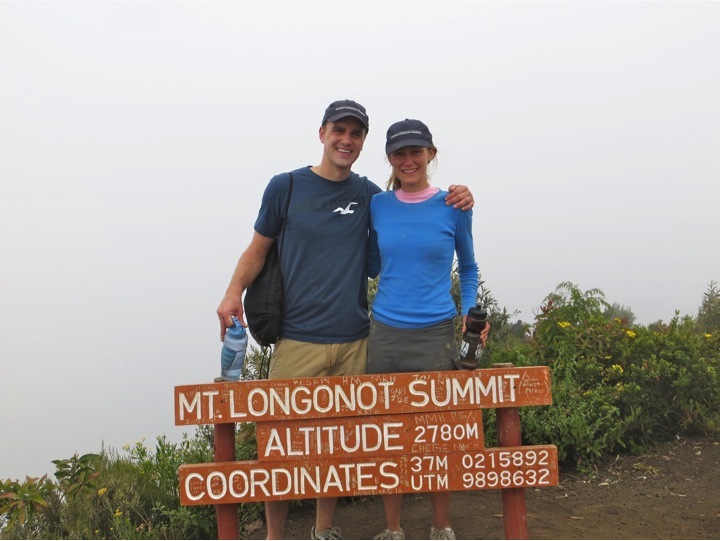 The summit! Sadly, the top of the mountain was in the clouds while we were up there and we couldn’t see anything but white. In typical Whitney fashion, every flower was pointed out and whenever she could get the rest of the group to stop for a second, she would snap a picture. 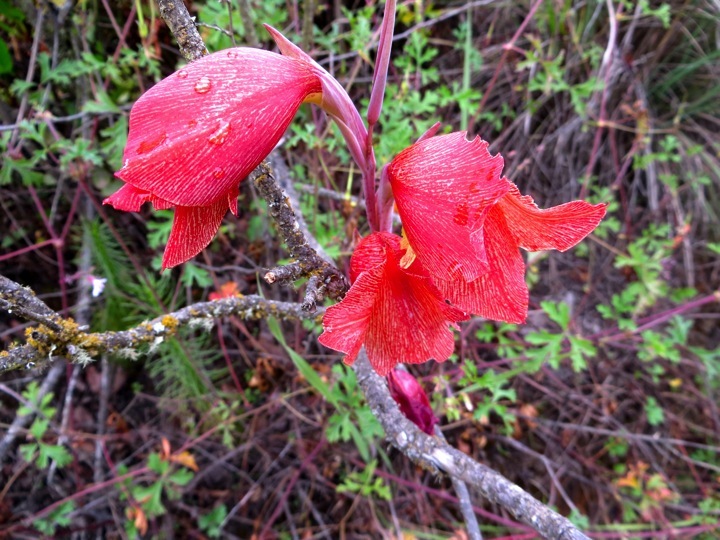 The water on this flower is from the moisture of the cloud condensing. Outside vs. Inside. We disagreed on what views we liked looking at best. Whitney loved looking to her right, at the ever changing landscape outside of the crater. 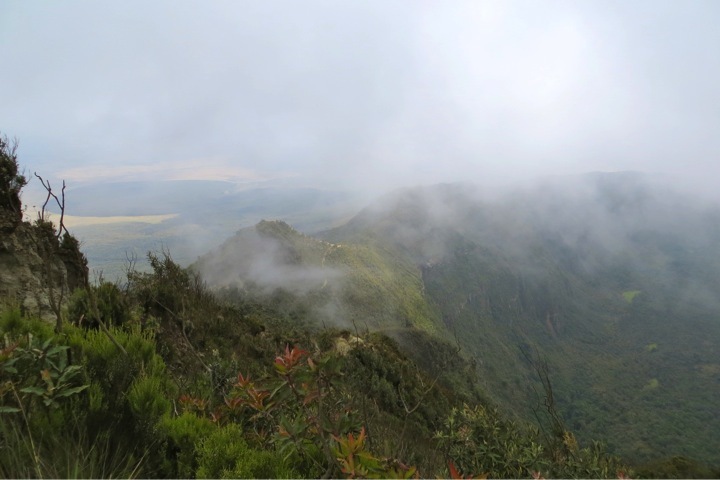 The picture on the top left shows the many rippling ridges beyond the mountain that reminded us of Kauai, HI. 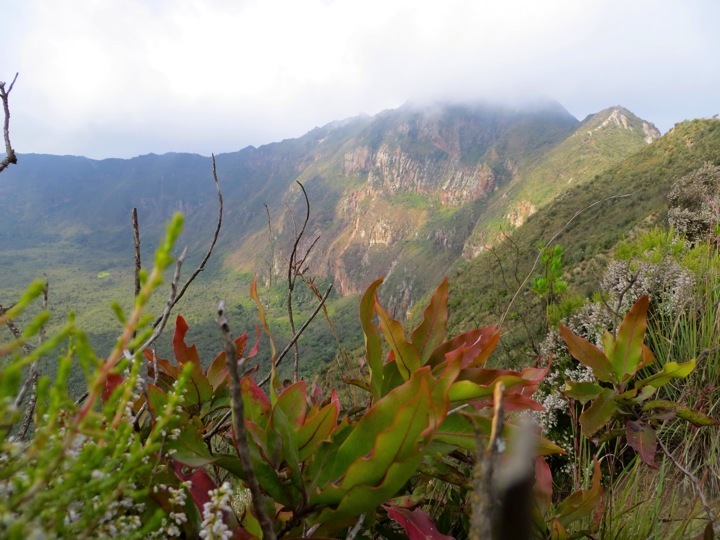 The picture on the bottom left shows the many different colors of vegetation growing which prompted Whitney to exclaim more than once, “It looks like a Monet painting!” Scott, on the other hand, was all about the massive crater inside the mountain. The top right picture gives some sense just how deep the crater was. 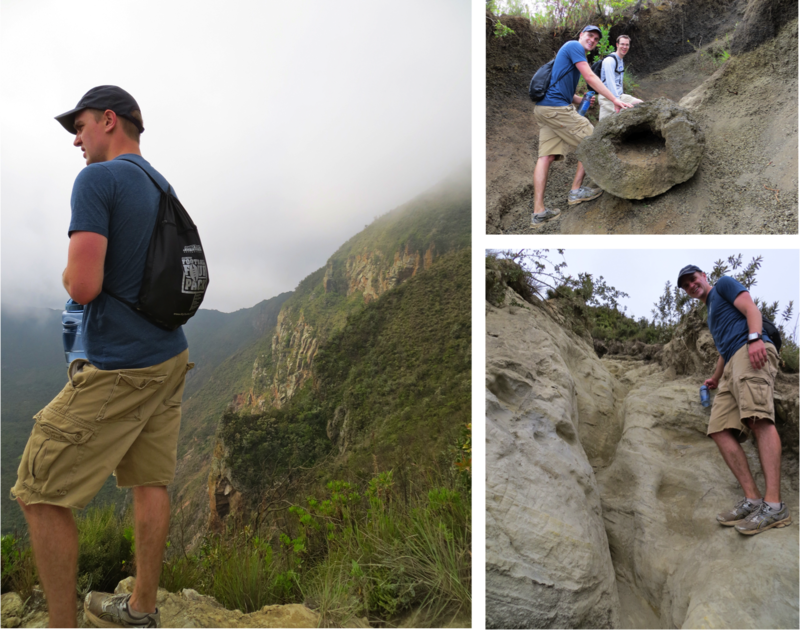 The bottom right picture shows how wide the crater is (over a mile wide) with the summit directly across from us. The shadows in the forest were made by some very tall trees stretching up and out over others. 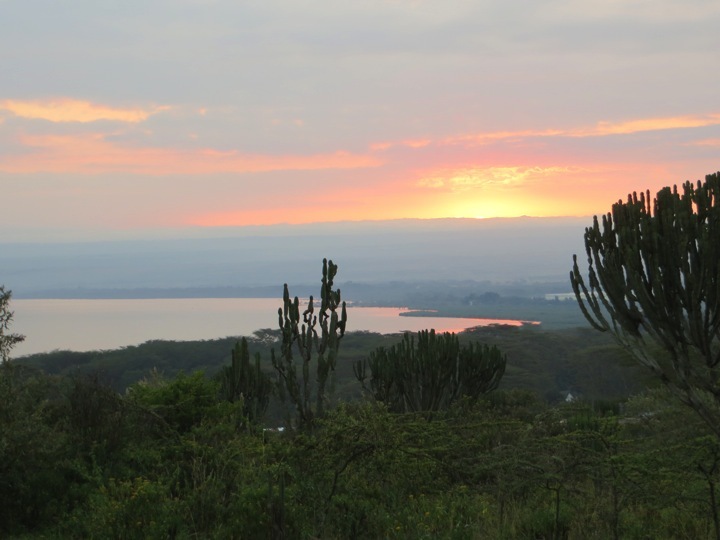 After climbing Mount Longonot, we headed directly over to Crescent Island on Lake Naivasha that afternoon. 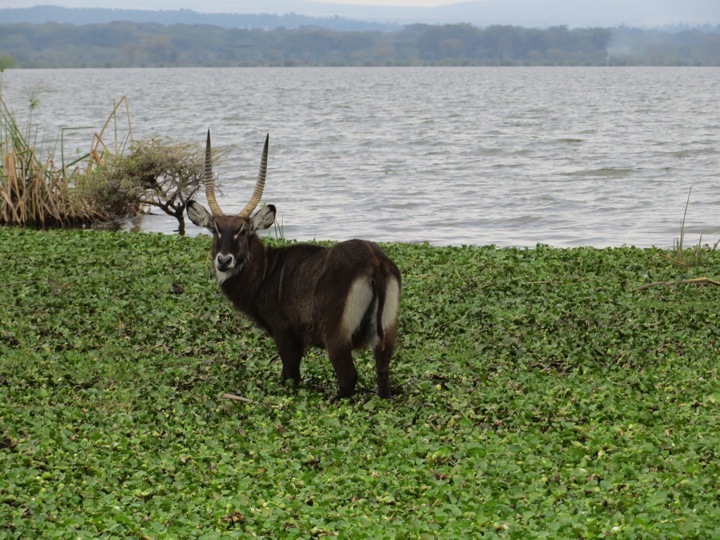 Crescent Island is actually a peninsula where many grazing animals live happily without any real predators. 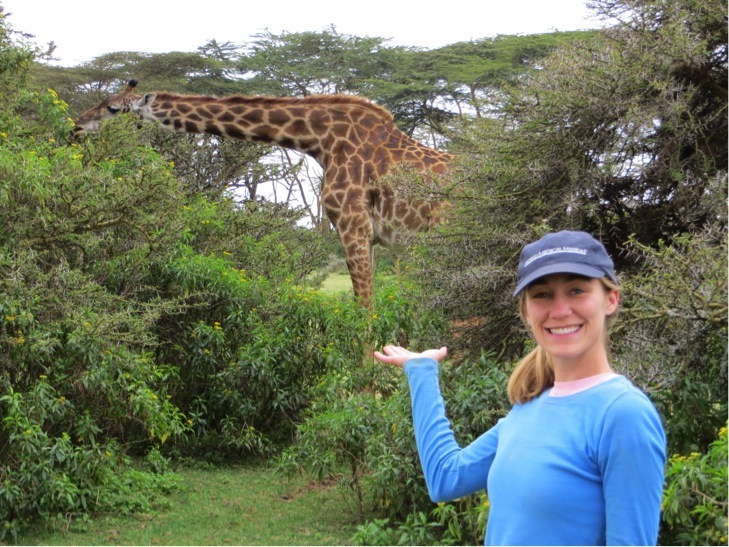 Since there are no predators, you are allowed to walk around the island and get as close as you dare to the animals. 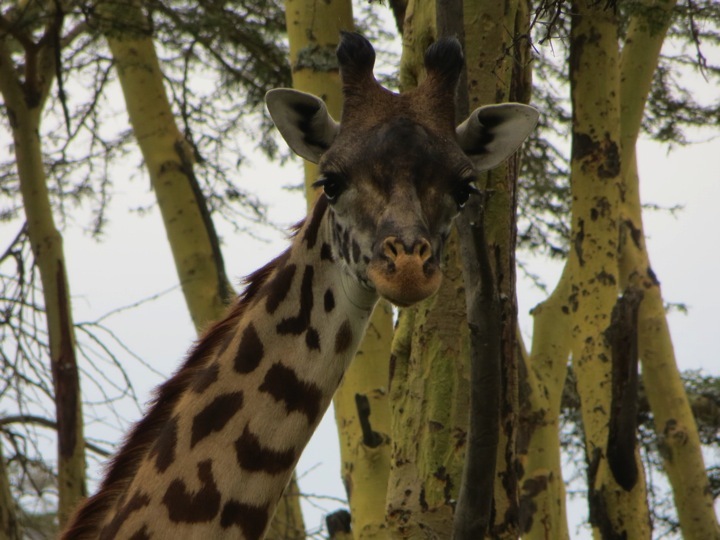 Upon entering Crescent Island through a forest of Yellow Fever Acacia trees, we were greeted by giraffes! 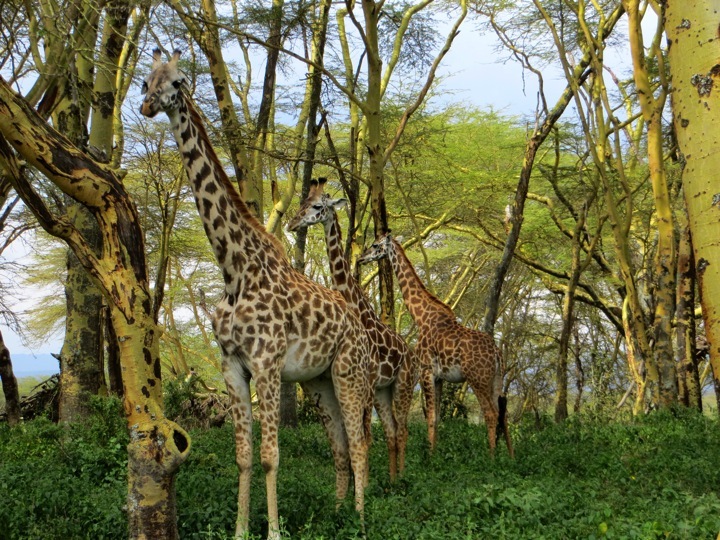 In this picture you can see Maasai giraffe (front and back) and a Rothschild’s giraffe (middle). 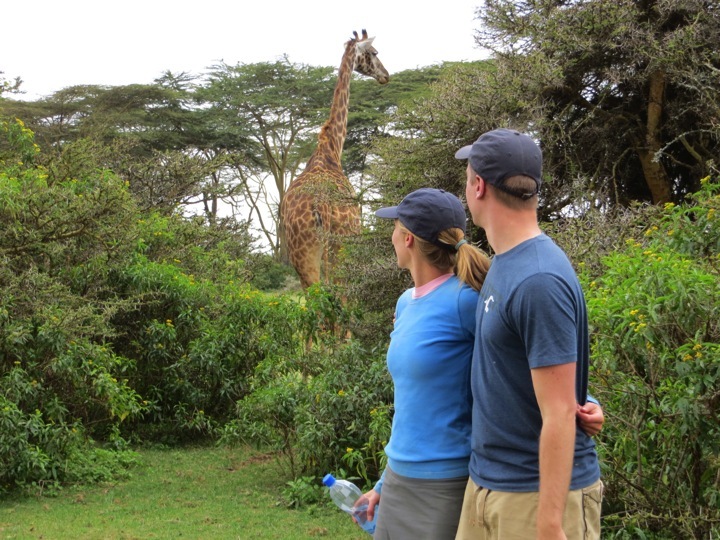 This giraffe was holding still for our picture, but when we heard it move we both turned to look to see where it was going and our driver snapped this picture. It’s an accidental favorite. Do the eyelashes make him/her seem feminine to you? 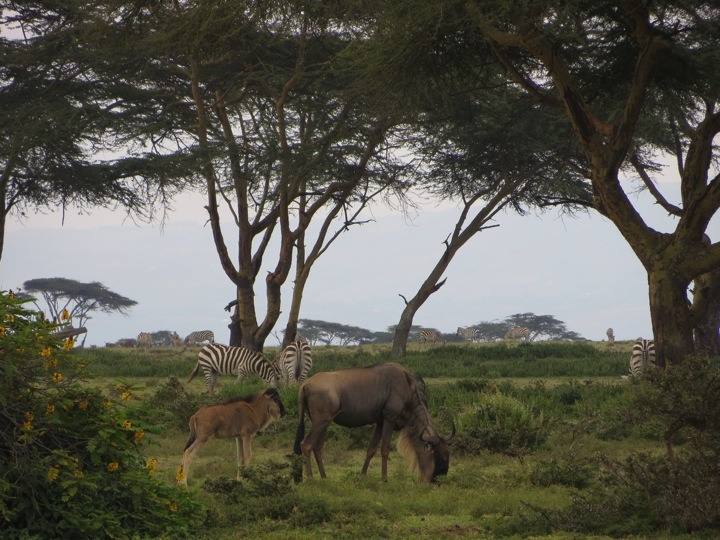 Just some wildebeest and zebra chilling beneath the acacia trees. Scott had Whitney slowly walk backwards smiling the whole time while this picture was taken. 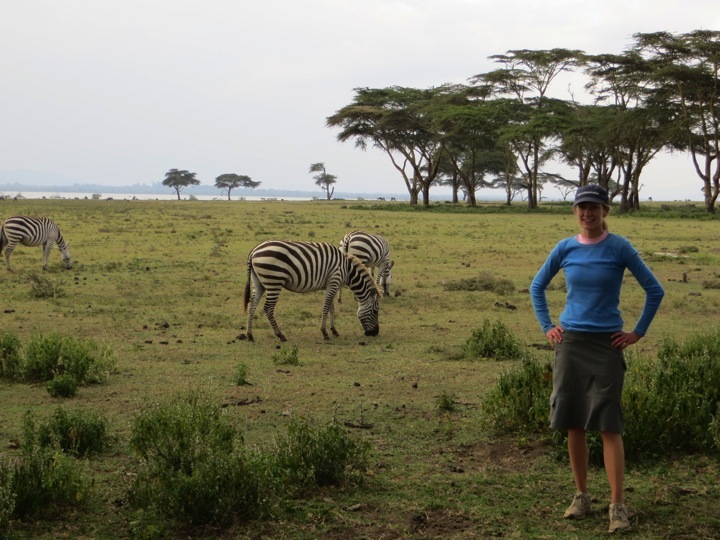 Needless to say, Whitney did not like approaching the zebras without being able to see if they were getting irritated with her nearness! 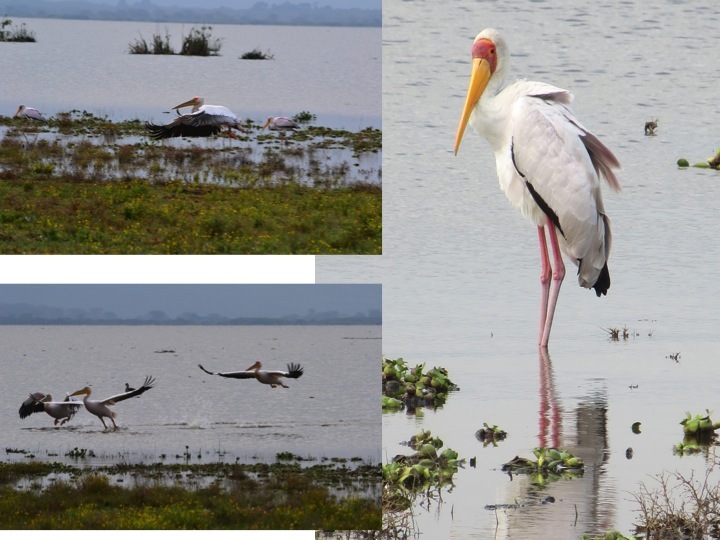 Great White Pelicans in flight on the left and a coy looking stork on the right. 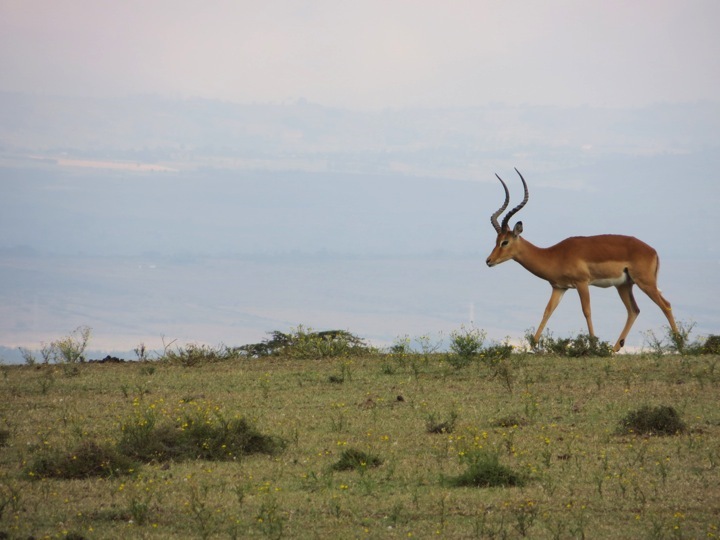 Male impala on the horizon. After a big supper at the Fisherman’s Camp restaurant, we went to bed early and slept slightly better due to our tired and worn out muscles. 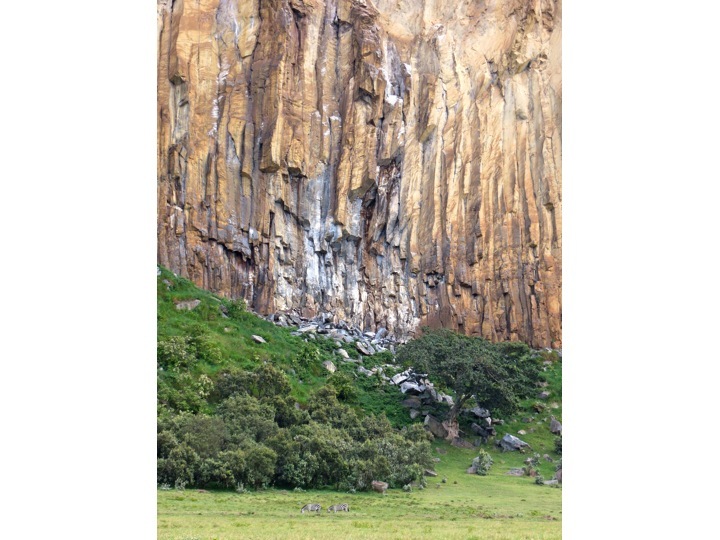 The next morning we woke up early again and headed to Hell’s Gate National Park. We rented bikes to bike through Hell’s Gate and convinced our driver to join us (he deferred on Mt. 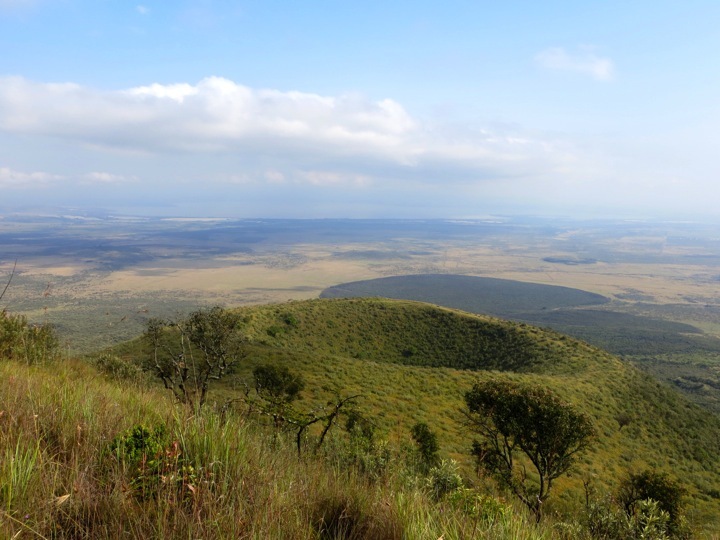 Longonot). 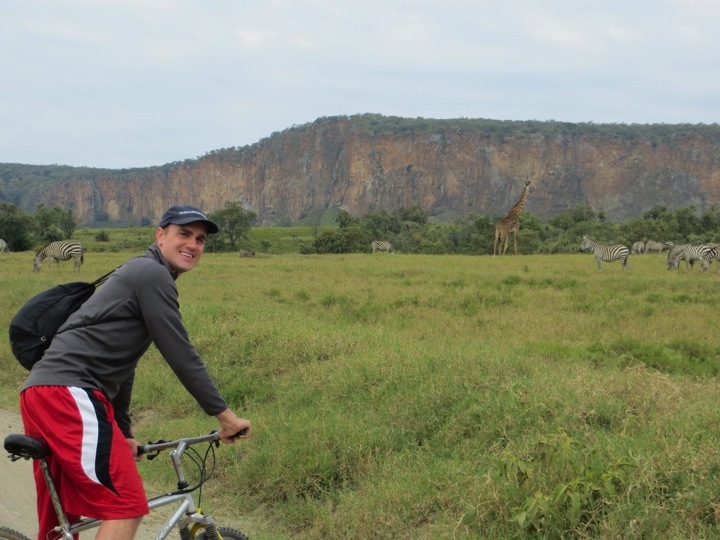 Hell’s gate has mostly herbivores with a few leopards, cheetah and hyena so it is relatively safe to bike through. 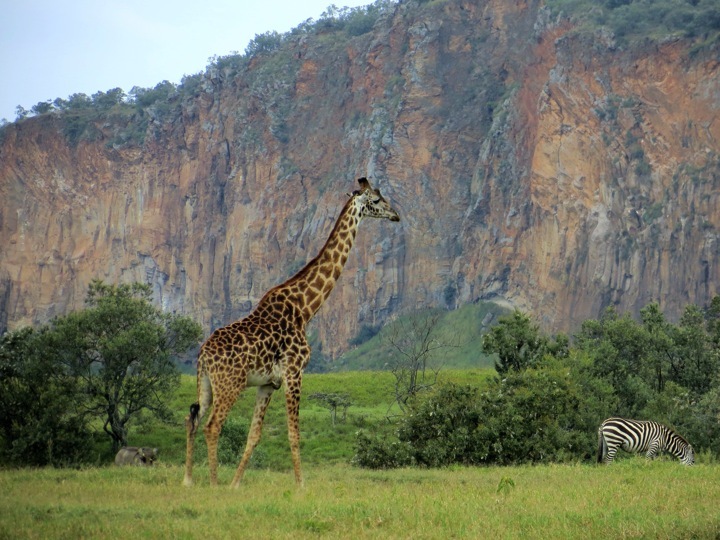 Ok, so, there are two zebra at the bottom of this cliff, but it’s the colors and texture of the cliff that we love! 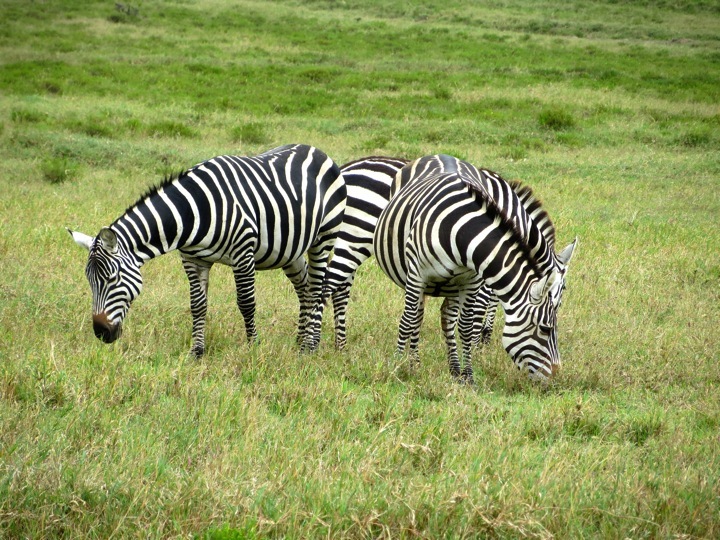 Crazy zebra stripes! Look at all the stripes on their legs too! 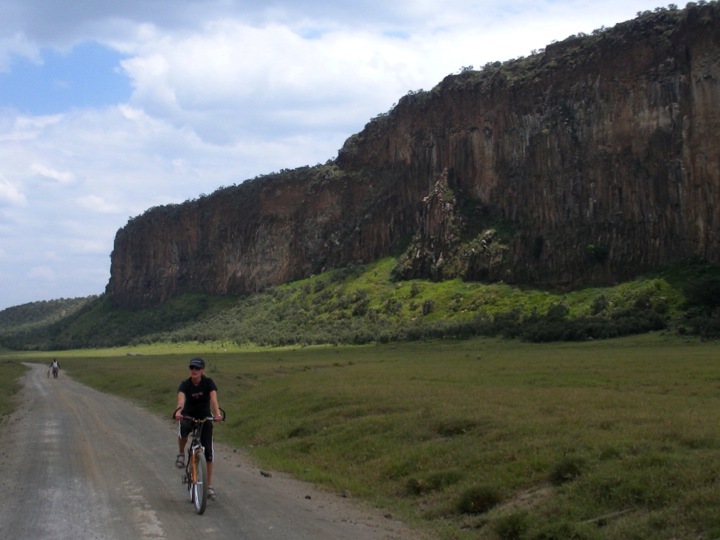 When we reached the other end of Hell’s gate we left our bikes and went with a Maasai guide through the gorge. This water was super-duper hot! Hell’s Gate, next to dormant Mt. 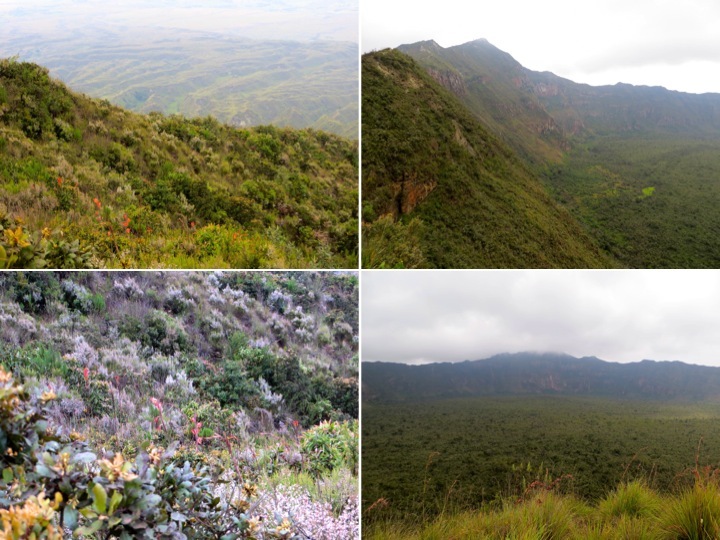 Longonot, is a site of geothermal activity. 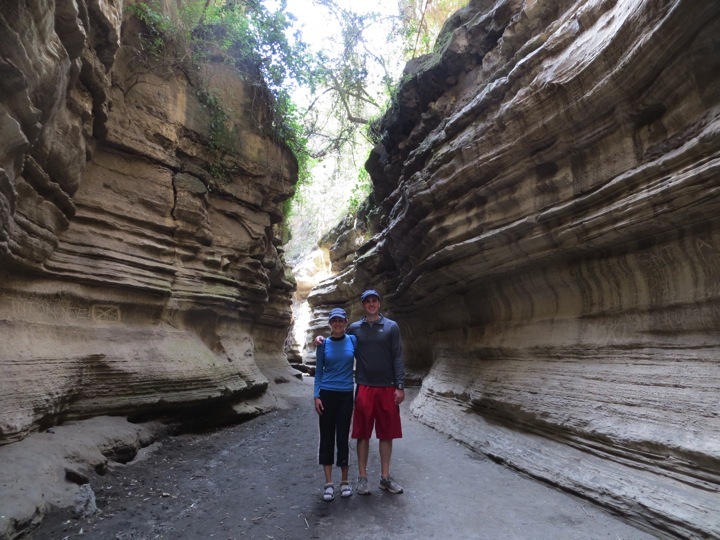 Here we’re using an Emergency Exit to climb out of the canyon to go see Central Tower up above. 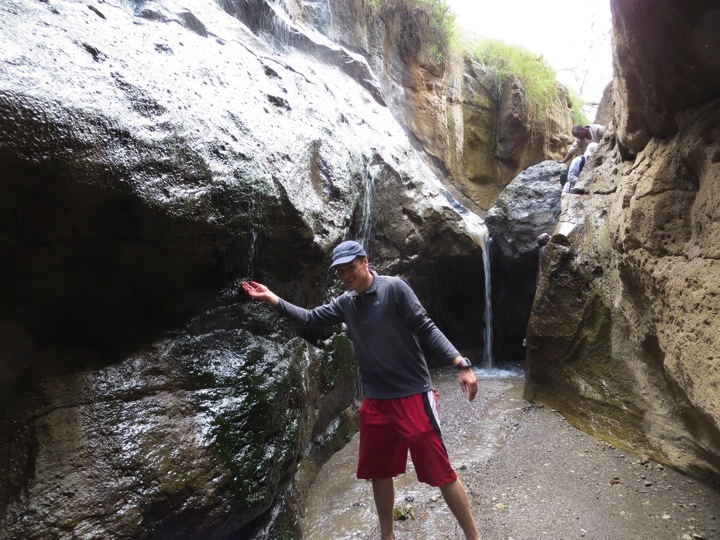 There are emergency exits along the canyon because there can be flash flooding of the canyon and in the narrow parts this means death for the person in it. 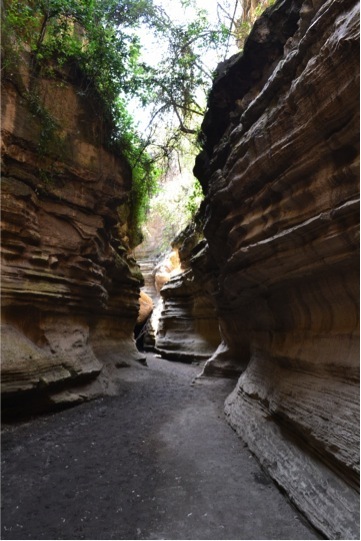 A half hour later, we were back in the canyon making our way to the Devil’s Bedroom when we were told that seven school children from Nairobi died here in April. There had been a flash flood and some children had not heeded the guide’s pleas to get to an emergency exit upon hearing the sound of distant water rushing. We had just been told this when we heard the sound of water in the distance. We saw the Devil’s Bedroom with its waterfall for all of a second before our guide started sprinting and yelling, “Quick! Quick! Move now!” Muddy water began flowing beneath our feet and we all sprinted through it, soaking our shoes and our socks, adrenaline pumping, acrobatically jumping from one rock to another trying to keep up with our agile Maasai guide, and wondering if we might see a flash flood or if we might get out in time. We reached this emergency exit and clambered up it as fast as we could. Luckily, it was a false alarm and it was suspected that a water pipe from the nearby geothermal energy plant had burst. Towards the end of our hike with the Maasai guide he dug up some ochre (what the Maasai traditionally use for face paint for ceremonies) from the ground, mixed it with water, and, upon Whitney’s request, painted our faces according to the traditional male and female patterns. 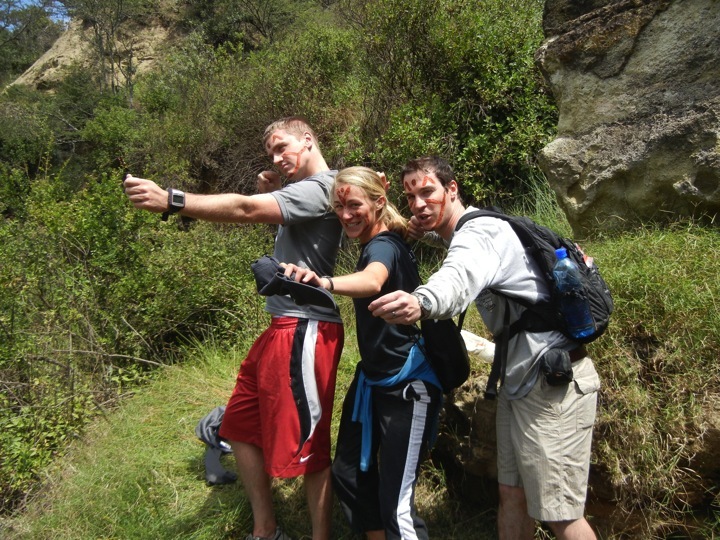 Here’s our best attempt to look tough with imaginary bow and arrows and spears. I’m not sure we live up to the face paint. 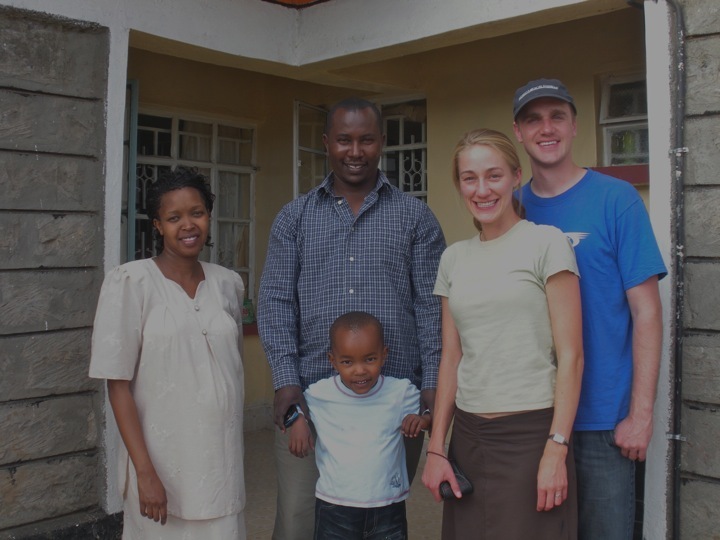 Scott and I with our driver, Antony, and his sweet family. We then returned to Tenwek quite tired, but happy with all we got to experience.